Now there's a silica gel canister you can recharge in the microwave! No need to turn on your oven and heat up your house to recharge. 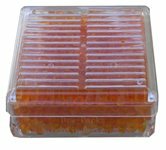 The 45 gram plastic container will protect your valuables from moisture damage and prevent corrosion, mildew, mold, rust and other moisture damage within an enclosed area. The see-through container has indicating gel that turns from orange to dark green when fully absorbed. The 45-gram canister measures approximately 2.25" x 2.25" x 1" and will cover an area of 3.3 cubic feet (length x width x height) of enclosed space. Cobalt Chloride free! These 45 gram canisters contain indicating gel that changes from orange to dark green when the silica gel needs to be recharged. The older style (blue to pink) contains Cobalt Chloride, a possible carcinogen to humans. The reformulated silica gel has the same moisture absorption capacity and effectiveness, but does not contain Cobalt Chloride. Ideally sized for many uses: guns, camera equipment, camping gear, silverware drawers, precision instruments, tackle boxes, storage boxes, tool chests, photo albums, collectibles and more. Directions: Insert canister into any container with your valuables. Use an airtight container for best results. When the orange beads turn dark green, the silica gel packet is fully absorbed and needs to be replaced. Conventional Oven (recommended method): To recharge the canister, place entire canister (do not open) on oven safe baking sheet and put in conventional oven at 240 degrees F for 3 hours. Microwave Oven (alternative method): Microwave entire canister (do not open) on high for 15-20 seconds. Repeat as needed until beads turn orange, allowing canister to cool completely each time.